All I seem to be doing at the moment is riding green horses. 4 year old Massimo has been XC schooling today at Lincombe to shake off some rust after his August holiday. He was very bold but also pretty green, but he should get round the British Young Horse Champs with out too many problems. My recent 3 year old new purchase,the very pretty and very gentle, Blizzard has had a week with Julie and Dave Mansell. They were a bit shocked when I suggested they had her for a week to break in, but I was right in my estimation of her, they had her riding in 48 hours. She is home now and riding greenly but nicely. 3 year old Sprout is now hacking out alone thanks to some help from some excellent baby sitters, Gill Young and Nikki Cox with their nice horses. 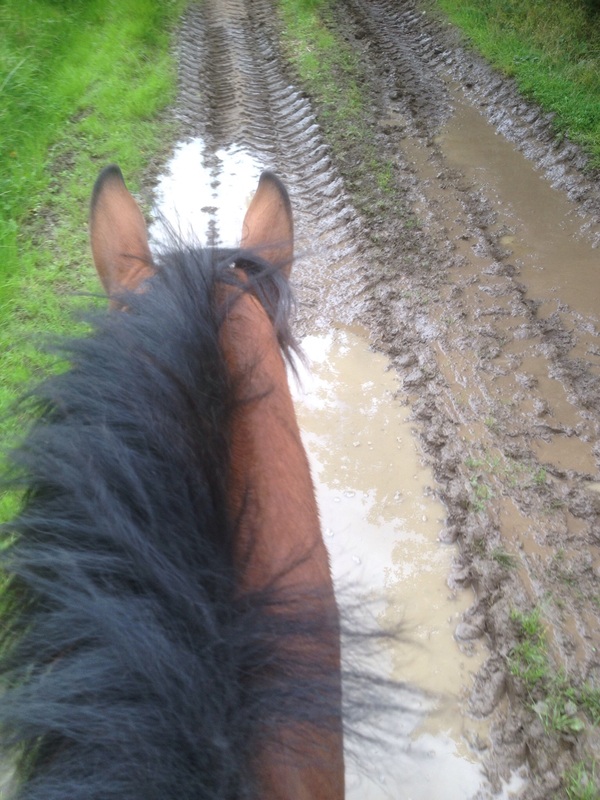 Today out hacking alone, he was learning all about mud and puddles, he’s very brave with a super want to please attitude. To finish this post I have some really sad news about Mighty Beetle one of my 2 year olds, he has wobblers syndrome and will have to be put to sleep fairly soon. He is very happy in himself but sways about & falls over for no real reason, becoming a danger to himself and anyone handling him. There is no cure. Very sad.